For all you gaming ladies out there, listen up: you can now purchase one-of-a-kind, fandom-inspired plushies at an affordable price, all thanks to Gemma Zigman and her Etsy shop, GRZCreations. A current student at Johns Hopkins University studying writing, Gemma is working on transitioning into the “real world” with plenty of business experience under her belt. Soon, she will have a degree as well. One of the most inspiring things about Gemma, aside from her entrepreneurial spirit, is her exceptional care for her customers. Read on to find out how this creative businesswoman has turned her passion into income! M3: Tell us a little bit about GRZCreations! 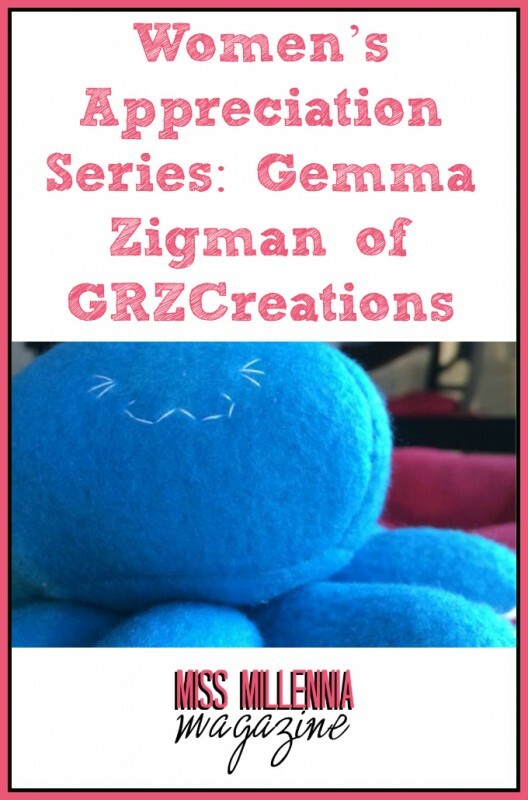 Gemma: GRZCreations is a little toy shop I opened online in November, 2014. My main products are plushies—little dolls crafted to look like video game characters. It’s still a fairly small shop since I just started, but I plan to expand my stock and available items by the beginning of February. For the most part, I stay away from the saturated markets. As much as I love Nintendo, the world doesn’t need more Marios for sale. I like to make characters and items that are under-represented, like the heroes of indie games, flash games, rhythm games, basically anything that isn’t a AAA title. I benefit because it guarantees my shop’s visibility since there’s little competition, and the customer benefits because I fill a gaping hole in a growing market. Gamers love this kind of thing (myself included). I see plushies for sale all the time at the various nerd conventions I go to. Unfortunately, most of the stuff I see for sale is made out of fleece or felt, which are fine fabrics to use but aren’t quite as soft as truly high quality material. Compared to a doll for sale at Toys R Us or even Build a Bear, gamers get short end of the stick. That’s what separates my shop from all the other video game shops—I use the highest quality materials I can find, and pride myself on work that is as accurate as possible to the source material. If I make a Navi plushie, you can be sure it’s not going to be a sad little ball of fleece with some limp bits of felt pretending to be wings. Your items are so adorable, and cater to such a wide audience, ranging from video game lovers, to those that just love a good fluffy companion. How do you choose which characters to transform into plush form? I started out with characters that I personally love. 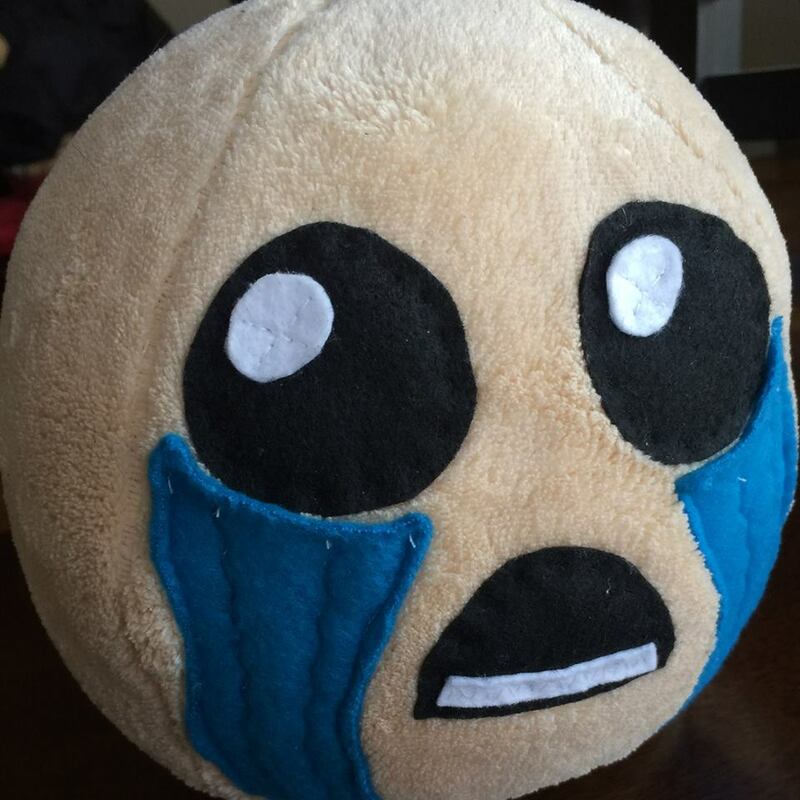 I’ve been playing the game “The Binding of Isaac” for about three years now, and I thought the titular Isaac character would be perfect. From there, I started taking suggestions from my gamer friends. They’ve been an infinite source of information in this whole process. There’s so many games out there, it’s impossible for me to be involved in the fandom for all of them, and my friends are like windows into these other fandoms. Which characters do people want to buy? What’s popular right now? Which game should I make more than one character for? And since my friends are more familiar with the characters than I am, they can call me out on anything that looks wrong with the design I come up with. On top of that, sometimes I get feedback from customers asking for specific characters. I make sure to pay attention to customer suggestions since I know they’re more likely to be returning customers if I cater to them (within reason). How did you learn to make these? My mom taught me the basics of hand-sewing when I was a kid, but other than that I rely on whatever YouTube or DeviantArt tutorials I find for examples, along with the sewing books I’ve bought or been given (shout out to family and friends for their help on this one). I taught myself how to use a sewing machine, how to measure, how to create patterns, all the technical parts of crafting. A lot of it is trial and error. Even though this sounds overly complicated, it suits my curious nature. To me, it’s more interesting to look at a pattern for a dress and apply those observations to creating a body. I’d rather struggle to figure out the geometry instead of have the answer right in front of me because once I have my solution I can do whatever I want with it. It’s how I’m able to adapt to each new design, each custom order—I take the same basic shapes I’m familiar with and just play around until I like the new polygon formed. What is your favorite creation thus far? It’s funny, but I think my favorite is the very first plushie I made. 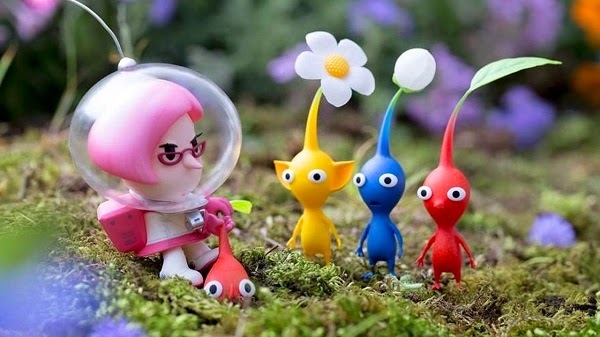 My boyfriend loves the game Pikmin, and he especially loves the purple Pikmin character. I wanted to get him one for his birthday, but the ones I’d seen online were just so blasé. So I decided to make my own, with little to no experience, no sewing machine, the wrong fabric, the wrong design, the wrong everything. Suffice to say, the poor little guy came out looking like a chicken with a green bean on his head. My boyfriend has this abomination on display, and for some reason I smile proudly whenever I see it. There’s probably some sentimental hoo-ha about my first creation or whatever, but I think it’s just that it looks so hilarious. What have you found most challenging about building your own business? The logo, the photography, and any and all branding. I’m happy enough with the little design I created on my own in Photoshop, but I really wish I felt comfortable enough hiring a graphic designer to make something even better. I want everything to look as professional as possible; that’s what I look for in a store, and that’s what I expect from my shop. And while my design now looks alright, it just doesn’t have that special oomph. Do you have any employees? If no, what is it like managing orders alone? Nope, it’s just me. The store is still just a bit too small to take on anybody else, although the first person I hire will be someone to handle my social media. I’m so bad with Twitter, Tumblr, and Facebook updates. It’s incredibly easy to lose track of everything quickly. I’m always paranoid I miscounted how many of each item I have to make, or that I’ve forgotten to ship an item out on time. I like to keep my orders organized on a whiteboard right next to my work station in my apartment. I’ve got a list of due dates to keep up with, a list of the amount of items I need to make, a list of custom orders I need to design, and a list of materials I need to buy. I like lists! Do you express your love for video games and fandoms through other mediums? Definitely! I mean, I was that kid writing really bad “Super Mario Sunshine” fanfiction when I was thirteen, but I think I truly joined the conversation in the gaming community when I became a Livestreamer over on Twitch, where I do Let’s Plays of the same games I create plushies for. If you have the time, feel free to join me at twitch.tv/gziggie, Monday-Saturday at 10pm. On top of my online presence, I also attend a fair amount of Comic, Video Game, and Anime conventions. I almost always attend in full cosplay regalia. Actually, I just came back from MAGFest, a “Music and Gaming Festival” outside of DC, where I cosplayed Toadette from “Captain Toad: Treasure Tracker”. I put my sewing skills to use, and made an item from the game—a turnip! In the future, I want to apply to be one of the vendors at these cons to really get my shop out there, and merge these very similar parts of my life as I often do with my cosplays. You’re currently a student at Johns Hopkins University. How do your academic pursuits fall into your plans for the future (if at all)? As a Writing Seminars major, I didn’t know what I wanted to do. Journalist? Author? Starving artist? I admit, although I love writing and literature, I felt pretty directionless with just those vague terms as guides. But as a shop owner with a degree from Johns Hopkins under my belt, I feel like I can go places. In this new role, outside of the self-imposed pressure to be the greatest writer ever, I can use my writing skills in more ways than just “published author.” I write all my own blog posts promoting the shop, I write all my item descriptions convincing customers to buy my products, I write every email between customers and other shop owners, and I write my own announcements. And because of my degree, I feel like I can justifiably say I have the skills to take on all these rolls without royally screwing up, simply because I’ve cultivated my voice as a writer (which is really the only voice you have on the internet). What is your favorite thing about being queen of GRZCreations? Haha queen? Oh my, I like that title. Honestly, as sappy as this is, it’s been the interaction with my customers. Of course it’s always nice to see happy reviews on my shop’s page. But often those reviews come with a back story, and that’s the memorable part of it all. Over the winter holidays, I had one customer order a BiblePlush Plushie for her son, and another customer who had ordered a BiblePlush Plushie for her friend as part of Reddit’s secret santa. As I was going through my list of orders, I happened to notice they both had the same shipping address. It turns out they had ordered the same item for the same person! Apparently he was very picky with what he wanted. I notified both customers, both of whom were amused at the accidental miscommunication. In the end, the Reddit user and I agreed to cancel her order, and she ended up buying a different version of the same item for her friend. I made sure to include a special note in that shipping package: “To [giftee], from [friend]…and Mom ;D”. Check out Gemma’s shop here, and be sure to check out her livestream at twitch.tv/gziggie Monday-Saturday at 10pm! Previous Post: « Are You Using Sunscreen Properly?